What Are The Best Affiliate Programs For Beginners? Last updated on January 5, 2019 By Nat 6 Comments This post may contain affiliate links. We appreciate you supporting Rags To Niches! Full disclosure here. 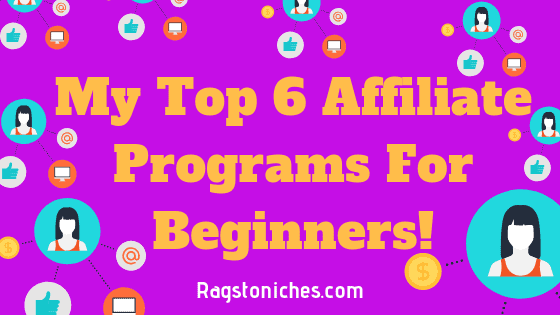 Today, I’m going to outline 6 affiliate programs that I PERSONALLY joined as a beginner. When you’re brand spanking new at Affiliate Marketing, you may find it a little challenging to get accepted on to programs. Well, that is, if you’re targeting the wrong programs! 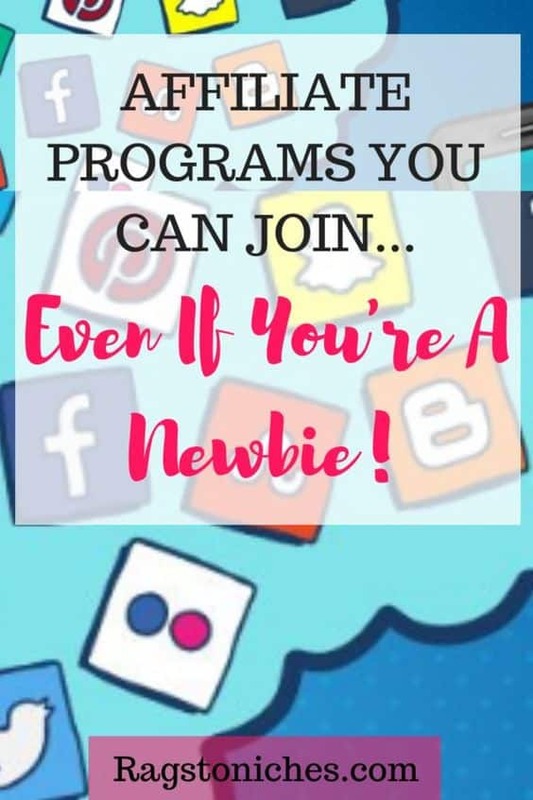 I personally never really struggled to get started with certain programs – but that’s simply because I only applied for ones that I knew I had a chance with. If you know who to apply to and HOW to apply, you shouldn’t have any problems at all! Do you have your blog set up yet? Check out my ultimate guide for setting up a money-making blog! It can be tempting when you get started, to just apply for affiliate programs all over the place. I can understand your enthusiasm, I also felt like this at first. But just… take a deep breath… and take a step back a moment. Before you start applying to programs, you need to have a solid understanding of your niche and of your potential audience. What sort of products are your audience going to be interested in? How are you going to incorporate these products into your blog or website? You can put regular links into your site before you ever apply to affiliate programs. So, you can write your reviews and use regular links first – make sure there is a decent amount of content on your site before you apply to anything. I wish I could remember exactly how many posts/pages I had when I applied to my first affiliate program. I was so impatient, because I literally thought I’d be making loads of money within a few months …. Yes, I’m sure many people think that in the beginning, (no matter what people tell them about it really, really taking time). But…. I really was convinced. So I worked hours and hours and hours trying to get content on to my site, just so I could apply to affiliate programs. When I got accepted, I must have checked my affiliate accounts every hour!! Try and avoid doing that, because it doesn’t help. Eventually, I found limiting myself to checking at certain times helped. My first website was in the kids toy niche, which obviously made product reviews an easy option. The very first affiliate programs I joined were Amazon and Etsy. Now, Amazon is great because it literally accepts you immediately on a trial-type basis. However, once you’ve got in initially, they then spend some time assessing you. But, count yourself lucky, because when I started you had to make a sale within 90 days, or your account would be rejected. Now you have 180 days to make a sale, but you need to make 3 sales in that time. That’s definitely a fair amount of time to just get a few sales. I was lucky enough to get my first few sales fairly quickly, within the first 90 days and therefore, have managed to keep my Amazon affiliate account active ever since. There are some people who put the Amazon affiliate down because, it only has a 24 hour window, (just 24 hours to get a sale after a potential customer clicks your link) and the commission rates are low. Between 4-10% per sale, depending on the category. But I am a huge Amazon affiliate fan, because I really think it provides one of the easiest ways for newbies to get a sale. After that first sale, they can always move on to bigger things – but sometimes, it just takes that first sale to spark enthusiasm. Amazon is a super-duper easy sell, because it’s a household name. If you send someone to Amazon, they’re already going to be comfortable with the brand and you also get a commission for ANYTHING at all that they buy in the 24 hours, it doesn’t have to be the thing you sent them for. So, I’m not saying it’s wise to build an entire business off the back of being an Amazon affiliate… (Although, some certainly have). I just think it can be a good way to learn the ropes and get those first sales under your belt. So, what I’ve included in my list here – are some of the programs that I actually joined as a beginner. If they accepted me, I see no reason why they won’t accept you! Just make sure your site/blog looks complete in t a way – that you clearly have posts and ideally have a small amount of traffic as well. If no one is visiting your site, no one is going to buy anything anyway. But guess what? I actually have a little site that does make sales on only around 25-50 visitors a day right now. I kind of abandoned it, but months and months later, still makes a little money. So, you can make sales on a small amount of traffic, (especially if you’re directing people to a brand they already know and trust! These are all programs that I personally joined as a beginner myself – apart from Shareasale, which I joined a bit later, but beginners can still join. One of my other first blogs was in the kids room decor niche and I wanted to join something that would be different to, but could complement Amazon. Etsy is unique because, you can find lots of original, homemade items. Also, the affiliate program works well because, it’s another pretty well known and trusted brand. In addition to this, they have a 30 day cookie. Which means, you have up to 30 days after someone clicks your link, to actually make a sale. The commission is still pretty low, you get 5% on returning customer sales and 8% on new customer sales. However, people on Etsy seem to spend pretty well and it does add up. Personally, I enjoy promoting Etsy items, as you’re also helping out independent sellers and getting them more customers. Another good thing, Etsy regularly run affiliate competitions. Within my first few months with Etsy, I won one of their affiliate blogging competitions and won £100 to spend on Etsy, (I’m in the UK) – which was a nice bonus at Christmas! They send you emails about their contests when you’re subscribed to their mailing list. In order to join Etsy, you must first join AWIN, (an affiliate network). AWIN houses thousands of affiliate programs, so it’s a good one to join anyway. And several more in another niche. I wrote a step-by-step post about how to join the Etsy Affiliate program, Here. One of the most recommended program for affiliates starting out and for a GOOD reason. It’s way easier to make your first sales with Amazon than arguably any other affiliate program. It’s how I made my first sales and what’s more, you can make your first Amazon sales on a pretty small amount of traffic. I think I only had 20 visits a day when I made my first sales and it could have been even less than that. Much of the time, the sales I make aren’t even for the products I’ve sent people to. Take a look at some recent sales I made on Amazon.com…. Brass Telescope? Hindu Elephant? Toner Cartridge?! These are just random things people bought after clicking my link. It can be pretty interesting checking out the things people have bought. Your commission will vary depending on what category people buy from. In the US commission ranges from 1%=10%, – in the UK it’s a little different and up to 12.5%. The amount of commission you get will depend on the country, so check out the info when you sign up. You need to apply to each countries Amazon independently. I signed up with Amazon USA, UK, Canada and France – although I stopped France after not making sales. There are ways to send people to the correct country on your blog, via just a single link. I personally use Genius Link and it’s been amazing. Amazon apparently do their own version, but I’ve never tried it and believe it’s not as sophisticated as Genius Link. Ebay pays you between 50%-70% of their revenue. Which may sound good, but then, remember they’re not generally making all that much on a sale, (depending on how much it went for). I found the Ebay affiliate program someone frustrating and I didn’t put much effort into it for long. But it was an easy one to join and there are success stories. Ebay includes some success stories on their website here. Whether Ebay is right for you, is really going to depend on your niche, but it’s a simple one for beginners and worth taking a look. I made some of my first sales with the Ebay affiliate program when I was in the Toy niche. Rakuten is another affiliate network, like AWIN. I wanted to join because they house the “Not on the Highstreet,” affiliate program. Which is another program that compliments Amazon quite well. They have some more unusual items. However, I did notice that they often had the same items on Amazon for cheaper!! In which case, I’d always use the Amazon link. They house many other programs though and is one that I easily joined as a beginner. Clickbank is one of the biggest digital marketplaces online today. You need to be careful with this one, because they have a lot of poor quality products. However, you can sign up right away and start promoting their products. You don’t even need a website to promote their products, (although I highly recommend you do). I’ve only really looked into products in the make-money-online niche and there is a lot of stuff I just wouldn’t recommend. However, there will be things in a wide variety of niches, so you could find something that works for you. I joined Shareasale much later, but it’s another affiliate network that you can certainly sign up to as a beginner. This is a network, so it houses many different affiliate programs. I joined it when I discovered and started using Tailwind, (a Pinterest scheduling tool). But it actually hosts thousands of different affiliate programs and you don’t any need any specific traffic requirements to sign up. StudioPress – The home to the Genesis WordPress themes. Redbubble – A print on demand platform. Grammarly – Great tool for grammar/spelling, with free chrome extension. Pic Monkey – A great tool for creating graphics easily. However, even though you will get on to the platform as a newbie, you then need to apply to individual programs from there. So, you’ll want to have some posts on your site before you go ahead and apply to any programs on here. The great thing is, you can always reapply though! If you do happen to get rejected from a program, you can apply again at a later time. So, those are some of the first programs/networks I signed up to as a beginner. Recommend Products/Services That You Use! Another thing you can do, (depending on the niche) is to recommend products and services that you also use yourself. Wealthy Affiliate, (I’ve been a member for several years – training, hosting, community included). Dare To Conquer, (Various courses in Pinterest, SEO, Affiliate Marketing & Blogging available). Swagbucks, (One of the few extra income sites I use most days). Genesis WordPress Themes, (my current WordPress theme is Genesis and I saw a major traffic boost after switching to them!). You’ll find that many of the products that you use, will have affiliate programs attached. They’ll be some of the easiest products for you to promote, because these will be things that you already use and love. With Swagbucks, they have a general affiliate program for anyone and everyone…. This is where you can earn 10% of everything your referral earns for life. Plus there are some additional bonuses you can get. However, once you’re an established blogger, you can get accepted on to their CPA program instead – this is where you will earn a set amount for everyone who signs up via your blog. This could be around $1.50 for mobile sign ups and $3.50 for desktop sign ups to start, but can go up depending on your performance. You can also join a CPA program for Swagbucks on various other platforms as well, such an the Panthera Network. Wealthy Affiliate, it is an all-in-one training and hosting platform, where you can get 50% monthly recurring commissions for premium members. With Dare To Conquer, you can get 40% commissions on any products with a 365 day cookie. So, that means, if someone clicks your link, but doesn’t make a purchase for 11 months… you will still get a sale. Of course, there are tonnes of examples I could come up with, but certainly promoting some products that you already know and love, will be a good way to get started. So, try and think of some things that you already use and value and see if you can fit those things into your niche. You may have noticed that I have Ads on my site. Well, unless it’s changed at all by the time you read this – I am with Mediavine for Ads. I didn’t put any Ads on my site whatsoever, prior to joining Mediavine. Mainly because, unless you have tonnes of traffic, most Ad networks pay such a small amount, I didn’t think it would be worth it. To join Mediavine, you need 25,000 sessions a month, (it’s different to pageviews, you can check for this metric in your Google analytics). It took me over two years to reach that goal. Don’t worry, many other people can get there way quicker than that, but for much of that time I purely relied on traffic from the search engines. Now I am trying to diversify and focusing on generating traffic from Pinterest too. A common option for newbies Ad wise is Google Adsense, which does not have a barrier to entry. However, unless you have many thousands of visitors a month, you’re not going to make much at all from Google Adsense. And if you do have tens of thousands of viewers a month, you should go with Mediavine, because they pay much better. Another alternative to Google Adsense is Media.net and are someone I almost went with myself several times. The only thing is, you do need to pay a fee to sign up – although, you do get some training along with that. So, if you’re going to pay to join a network, you want it to be a good investment and one you can recoup before long. What’s the point in a few cents a day here and there? You may as well wait until you can make something half reasonable. So, that about wraps this post up for today. Have you tried joining any affiliate programs yet? Let me know in the comments. How to make your first affiliate sale. 5 Legit online companies that have paid me recently. How long does it take to make money affiliate marketing. Hey Nat! Thanks for the shoutout! Did you resist joining Amazon when you heard about the 24 hour cookie period? I know it turned me off for many years. It’s only in the last two years where I realized that it’s easier to convert with Amazon since so many people trust it. Like you when I realized I could earn on anything people buy, that was the turning point for me. And it’s paid off. So I totally agree with you. Your post was an interesting one it gives some nice information about each affiliate service a newbie or beginner can join. I have only joined Amazon I haven’t really looked at any of the other affiliate programs, I know ClickBank is where some people in MMO Niche go to find programs to review. I haven’t actually thought about putting ads on my site through google adsense or any of those other ones then again I don’t have much traffic anyway. Even If I did have a lot of traffic I don’t know if I would do it, but who knows maybe I will one of these days. I do promote two programs though WA and SA but those are the only affiliate programs other than Amazon I with. I know whoever wants to know about ads and getting affiliate programs they will get a lot of information in this post. Thank you for the share I do hope the best for you.